Despite the controversy surrounding Storage Wars and Dave Hester's allegations against it, the show continues to be the most popular program on A&E, and it's not going anywhere. Indeed, even as rumors fly about three more stars being cut, the show continues to film new episodes – and grow into new territories. 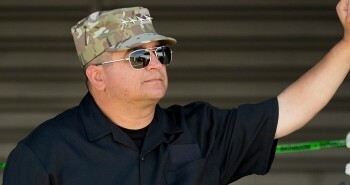 Storage Wars already has plenty of spin-off series, including Storage Wars: Texas and Storage Wars: New York. Now the series is moving to Canada, where its rights have been purchased by OLN. Storage Wars: Canada is casting right now, and developers are scouring the country looking for Canadian treasure hunters with the same amount of flair of the U.S. stars. Rogers Media, the Canadian company that owns OLN, insists that their version will deliver all the same wisecracks and excitement of the U.S. version of the show while remaining completely authentic. Producers have already declared that units will not be salted or faked. Of course, they can hardly be expected to say otherwise, so viewers may take that with a grain of salt. According to an interview on Huffington Post, Dan and Laura Dotson are making their way north of the border to participate in the program, which starts filming this month in Ontario. This certainly explains their disappearance from the rosters for the American series, and it should help bring fans over from one show to the other. But what can we really expect from a Canadian Storage Wars? According to the interview with Dan and Laura, the program will be mostly focused on the bidders themselves, with less emphasis on the auction finds. The show will follow behind-the-scenes with bidders as they prepare for and travel to auctions, in order to best capture the spirit of the Canadian setting and the colorful local cast. To particular interest for auction hunters may be the cultural difference in treasure-hunting up north. If handled deftly, these cultural differences could make for an intriguing show indeed. Then again, it may prove to be nothing more than a money grab and tired reiteration of a successful premise. We won't know until we see it. Next postWill Nabila Haniss Join the Cast on Storage Wars as the New Villain?